Today we explain how BuddyCare solution works and makes the surgery process easier for patients. We also share instructions how you can demo and try the app. Hi all! In the previous post, we shared how Buddy Healthcare was founded. Today we’d like to explain how our solution for surgeries works and makes the process easier for patients, their families and care personnel. Meet and greet our BuddyCare mobile app! In short, this is what our solution is: pre- and post-surgery care aiming for enhanced surgery experiences and outcomes for all patients. To implement this, we’ve developed a mobile app called BuddyCare. What this basically means is that BuddyCare ensures that patients will be at the right place, on the right time, properly prepared. Sounds like a big promise, huh? Well, you’ll see how it works, if you check out the app. The core of the app is an interactive timeline where it’s easy for the patients to follow the most important instructions, fill necessary forms and read information. Now you might think that well, a timeline doesn’t sound like a very ingenious solution: just presenting information in a chronological order. There’s actually more than that: meaningful colors and status-based content is used for each timeline event to make it as smooth as possible for the patients to figure out what’s going on. You may try it out yourself and see how it works! And you can check it out without having a surgery! Download it from App Store or Google Play . After you’ve installed the app, open it and click “Try Demo”. Then you may assign yourself a surgery and schedule a date and time. Any comments and feedback on the app are more than welcome! 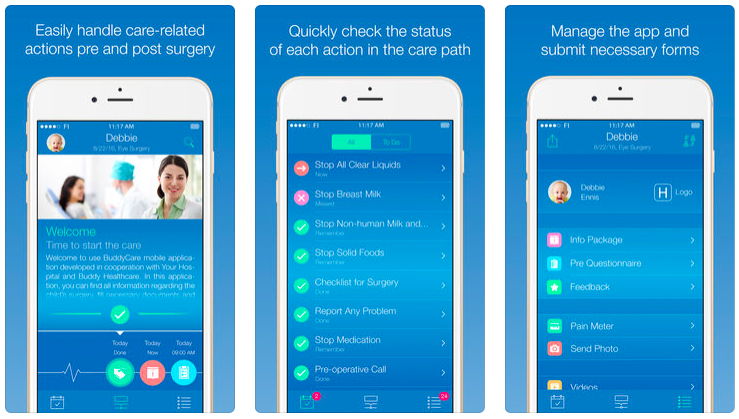 In the app, you’ll see not only a timeline but also a moment list, where the patient may view surgery instructions to remember, such as restrictions on eating, drinking and taking certain medications before the surgery. Traditionally overwhelming amount of such information and piles of paperworks are transformed into a simple mobile app traveling safely in your pocket. Hope this makes it clear for you how we at Buddy Healthcare drive patient engagement, and if you have any questions about the app, don’t hesitate to ask in the comments below! In the next post, we’ll discuss surgeries themselves, patient and hospital-related challenges and share our take on that. Thank you for following us, join the discussion and stay tuned! How we started Buddy Healthcare?